Fill in the blank: Jesus said that false prophets come in sheep's clothing, but are really ferocious ___. 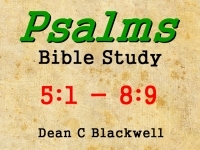 Now in Psalm 5 and of course this subscription to the Chief musician upon Nehiloth, the first part of Psalm 5 actually goes on the last part of Psalm 4. Now the word Nehiloth is the word for wind instrument, so you have this Psalm 4 on a Clarinet, wind instruments, not on strings like Psalm 3 would be, so the message of Psalm 4, the pace of it, the tenor of it, is more of a type, attitude or feeling that would fit the wind instruments. So when you see this word Nehiloth then you need to think about that type of a move or message or rhythm.